Call it a ballad of the west, a folk opera or a masterpiece of musical theatre, Tom Russell’s latest epic THE ROSE OF ROSCRAE will audibly move, absorb and inspire any listener who dives headfirst into this pool of western folklore. The project may have been twenty years in the making but its fruition through a stellar cast, the wonderful merging of new and borrowed songs with archival field recordings and a story etching to be told, make it a lifetime piece of work from a prolific artist passionately dedicated to his cause. Time may dictate that ultimately a number of the songs will evolve into separate entities, although this should only occur once grasping their context and role within the brilliance of the project. Quite simply THE ROSE OF ROSCRAE is built for the stage and Broadway has to be its ultimate resting place. However the interim is all about engrossing your mind in the story Tom tells and marvelling at how so many aspects of the West are woven into its soundtrack especially within the strapline theme of 19th Century Irish emigration. A brief synopsis of the story sees a young Irish lad flee his homeland in the 1880’s and head west for a cowboy life which is recalled through the words of the subject several decades later. We are introduced to many characters along the way, none more recurring than his first and true love, The Rose of Roscrae. Two versions of the title song appear in this body of work which spans two discs, is unsurprisingly billed as two acts and lasts a fulfilling two and half hours. Tom, who adopts the role of the main character known as John Dutton and often referred to as Johnny Behind-the-Deuce, masterly delivers the inaugural version with acclaimed Irish American-influenced songstress Maura O’Connell wrapping up proceedings with a stunning rendition of this superb song written by Tom, Gretchen Peters and Barry Walsh. Barry undertakes a co-producing role on the record, while Gretchen takes her place amongst an amazing list of performers including Eiza Gylkyson, Jimmy Dale Gilmore, Jimmy LaFave, Joe Ely, Ian Tyson, Jerry Douglas, and Gurf Morlix to name a mere handful. If you were to inevitably extract a number of tracks for isolated listening then obvious candidates would be ‘When the Wolves No Longer Sing’, ‘Ain’t No More Cane on the Brazos’,’Doin’ Hard Time in Texas’ and ‘Resurrection Mountain’. However these songs form only part of the decorated canvas as field recordings from illustrious American historical figures such as Walt Whitman and Leadbelly, weave into the narrative courtesy of Tom and the outstanding use of soliloquys to thread the concept into an enterprising finished product. The sheer educational impact of this record will see you researching further the life of St. Damien of Molokai, a Belgian missionary who the main character turns to in one of the many dark moments, thus removing any glamour of the cowboy life. Encounters with the landscape, original inhabitants and fellow migrants add a real life flavour to a tale which never loses touch with its Celtic roots. An eventual reunion with the Rose of Roscrae provides a stimulating finale free of stereotypical clichés. With circle of life connotations, the overriding message is that the last frontier can be conquered despite the many obstacles and terrors. Tom’s unrelenting passion to present the reality of the West is a joy to share and how ultimately love, faith and spirit lead the way on the pioneering trail. Tom’s cast of many includes the Norwegian Wind Ensemble who under the arrangement of Mats Halling delivers the soundtrack overture split across the opening shots of both discs/acts. 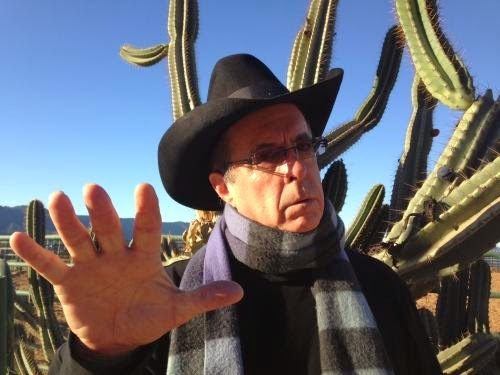 Apart from obvious rambles around Texas (which includes a hair tingling patched up version of Guy Clark’s ‘Desperados Waiting for a Train’) and New Mexico, the story also ventures south of the border. The songs ‘Guadalupe’, (another Gretchen Peters contribution) ‘Valentine de la Sierra’, ‘Poor Mother Mexico’ and ‘Gallo del Cielo’ provide the welcome sprinkling of a Latino sound with some splendid accordion from Joel Guzman. In support of this monumental project, a 96 page book has been published providing full details on the songs, performers and background of which there is plenty to analyse within the 52 tracks. This accompaniment should perfectly supplement the listening experience and hopefully its UK availability will widen upon album release and ahead of Tom's tour. One thing for certain is that this piece of work is highly addictive and once you have scaled the hurdle of initial listen, the desire to keep returning is all consuming and the inhalation of newly discovered interpretations keeps the fire of interest roaring. 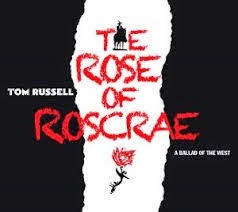 If Western music is to get a deserved resurrection then Tom Russell is its keenest contemporary disciple and THE ROSE OF ROSCRAE will provide a marker for historical context and act as an outstanding arrangement of song, sound and prose. Once this album is rolled out the consumer conundrum of entity versus song selection will determine its commercial viability. While the former is strongly advised, there is merit in the latter especially if it provides tangible rewards for its architect. Tom Russell tours the UK in the autumn and it will be fascinating to see how he presents the record alongside his enormous back catalogue. In the meantime critical reaction to the record will be keenly observed from the high ground of holding the opinion that THE ROSE OF ROSACRE is a magnificent piece of work.